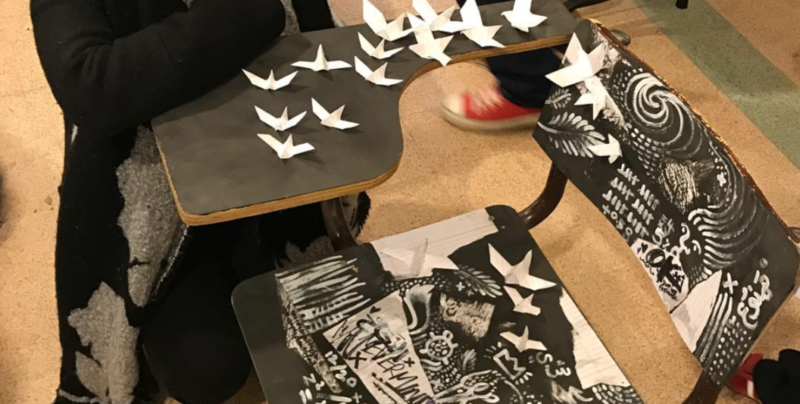 My participation in Mike V. Derderian’s exhibition idea about taking a step back into school days, where all artists got to illustrate/ paint on a desk each. http://jordantimes.com/news/local/artists-recapture-their-school-days-turning-desks-works-art. My back to school journey. I always struggled with school. The idea that I had to sit down and focus – on anything, whether science or literature, was impossible to me. This exhibition gave me the opportunity to look back at my school experience, look through my old books and doodles, and realize what inspired me the most were the books with illustrations. This included Aesop’s Fables, as well as the huge (and heavy) biology books. It seemed the only way to get me interested in any subject was to explain it to me visually, and this is what I translated onto this desk. A visual journey of my experience – and how badly I needed as a student to be set free from such a dry and “cookie cutter” way of education. This is a link.